The Official H-Body Internet Community • View topic - Landau Top ? I've never heard of a factory half vinyl top on a hatchback either, that sounds custom to me. The Monza homestead page has some info on which cars had which vinyl roof options. My opinion is if you own it, do what you like to it, so you will get out and enjoy it! Thanks for the info Guys, I feel more comfortable making it my own. I personally am not a fan of vinyl tops. Kinda like the targa bar though. a1racing wrote: Thanks for the info Guys, I feel more comfortable making it my own. I personally am not a fan of vinyl tops. Kinda like the targa bar though. I think the targa band only came on the cars that had the glass roof, I believe they are stored with 100 hens teeth. I had a Skyhawk just like that. Same color, 10 hole chrome rims, and steel roof with the targa band across the top. Clyde, I can see a certain amount of unpleasantness (rust bubbles) under the vinyl top. It will have to be addressed when I remove it. I will keep my eyes on the prize. When that car was for sale the second owner thought it was original. How it was put on is unknown but they even added a trim piece at the back. Clay, you mentioned that yours has a half vinyl top. Does it begin where the targa band would have been, if it had one? What kind of trim is holding it down on the leading edge of the top? Has anyone on here ever seen an example of a half vinyl top on a hatchback? 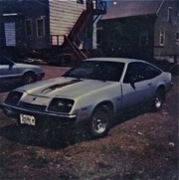 Way back in the day, my brother had a body shop convert his full vinyl top to a landau top, it almost looked factory, except you could tell by how the trim piece was attached over the roof, if you looked close enough. To be a factory roof, I'd imagine GM would have used the same type of trim here as a notchback. What holds that trim on? From the pictures posted (thanks by the way) it looks to have a full Vinyl top. That was an option on some Hatch Backs. But I have never seen a factory 1/2 Vinyl top on a HB, but it could be possible with the Targa Band, either in front or behind the band. In front would not look bad, but behind would look odd to me.